Firmly grounded by the hallmark strengths of all Norton Anthologies―thorough and helpful introductory matter, judicious annotation, complete texts wherever possible―The Norton Anthology of English Literature has been revitalized in this Eighth Edition through the collaboration between six new editors and six seasoned ones. Under the direction of Stephen Greenblatt, General Editor, the editors have reconsidered all aspects of the anthology to make it an even better teaching tool. Stephen Greenblatt (Ph.D. Yale) is Cogan University Professor of the Humanities at Harvard University. Also General Editor of The Norton Anthology of English Literature, he is the author of eleven books, including Tyrant, The Rise and Fall of Adam and Eve: The Story that Created Us,The Swerve: How the World Became Modern (winner of the 2011 National Book Award and the 2012 Pulitzer Prize); Shakespeare's Freedom; Will in the World: How Shakespeare Became Shakespeare; Hamlet in Purgatory; Marvelous Possessions: The Wonder of the New World; Learning to Curse: Essays in Early Modern Culture; and Renaissance Self-Fashioning: From More to Shakespeare. He has edited seven collections of criticism, including Cultural Mobility: A Manifesto, and is a founding coeditor of the journal Representations. His honors include the MLA’s James Russell Lowell Prize, for both Shakespearean Negotiations: The Circulation of Social Energy in Renaissance England and The Swerve, the Sapegno Prize, the Distinguished Humanist Award from the Mellon Foundation, the Wilbur Cross Medal from the Yale University Graduate School, the William Shakespeare Award for Classical Theatre, the Erasmus Institute Prize, two Guggenheim Fellowships, and the Distinguished Teaching Award from the University of California, Berkeley. He was president of the Modern Language Association of America and is a fellow of the American Academy of Arts and Sciences, the American Philosophical Society, and the American Academy of Arts and Letters. Carol T. Christ (Ph.D. Yale) is Professor Emeritus of English at the University of California, Berkeley, and President of Smith College. She is the author of The Finer Optic: The Aesthetic of Particularity and Victorian Poetry and Victorian and Modern Poetics and editor of the Norton Critical Edition of The Mill on the Floss and, with John Jordan, Victorian Literature and the Victorian Visual Imagination. She is the recipient of an NEH Fellowship and a member of the American Academy of Arts and Sciences. Catherine Robson (Ph.D. UC Berkeley) is Associate Professor of English at New York University and a faculty member of the Dickens Project. She is the author of Men in Wonderland: The Lost Girlhood of the Victorian Gentleman and Heart Beats: Everyday Life and the Memorized Poem (forthcoming), and has received fellowships from the NEH, the Guggenheim Foundation, the University of California, and the Wissenschaftskolleg zu Berlin. M. H. Abrams (1912―2015) was Class of 1916 Professor of English, Emeritus at Cornell University. He received the Phi Beta Kappa Christian Gauss Prize for The Mirror and the Lamp and the MLA's James Russell Lowell Prize for Natural Supernaturalism. He is also the author of The Milk of Paradise, A Glossary of Literary Terms, The Correspondent Breeze, and Doing Things with Texts. He is the recipient of Guggenheim, Ford Foundation, and Rockefeller Postwar fellowships, the Award in Humanistic Studies from the Academy of Arts and Sciences (1984), the Distinguished Scholar Award by the Keats-Shelley Society (1987), and the Award for Literature by the American Academy of Arts and Letters (1990). In 1999 The Mirror and the Lamp was ranked twenty-fifth among the Modern Library's "100 best nonfiction books written in English during the twentieth century." 9. 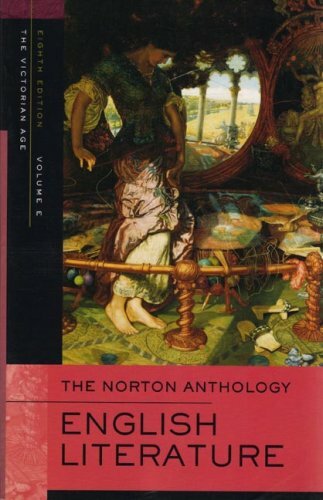 The Norton Anthology English Literature, Volume E: The Victorian Age Greenblatt, Stephen J.; Abrams, M. H. and Christ, Carol T.
The Norton Anthology English Literature, Volume E: The Victorian Age Greenblatt, Stephen J.; Abrams, M. H. and Christ, Carol T.